How well do you know that expensive appliance you rely on to keep your home warm in winter and cool in summer? If you’re like most homeowners (and even business owners), there is a better-than-average chance you remember the existence of your HVAC (heating, ventilation, air conditioning) system only when it stops working properly. If you have a professional HVAC contractor you trust and a regular maintenance plan for your air conditioning and heating system, you can think of this post as a great source of knowledge to help you prepare for the future. If you are considering replacing your existing HVAC system or you suspect your system may be due for maintenance, this post can give you more knowledge of how your system works and how to optimize for lower costs. While every type of air conditioning and heating system essentially does the same job, how they get there can look very different, as can the units themselves. Here is an overview of some of the most popular types of systems. See if you can recognize yours in this list. Portable. This type is typically a stand-alone air conditioner or heater that is lightweight and easy to move from room to room. Window unit. This type typically fits into the standard window frame to heat or cool small areas. Ductless split. This type of unit is often wall- or floor-mounted and is an efficient choice for small spaces. Central HVAC. This type of unit is designed to heat and cool larger spaces such as homes or workplaces. Even the smallest HVAC units operate on the same basic premise of changing the temperature of the air being pulled in to accommodate your indoor comfort. Here, we will look at the anatomy of a central HVAC unit, the most complex unit out of all your choices. 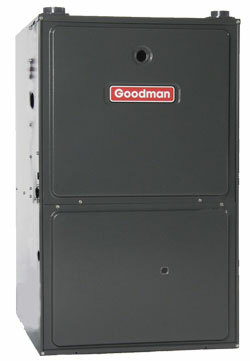 A central HVAC unit has four different main components: the evaporator, the compressor, the condenser, and the expander. By working together, these four components use an additive called a "refrigerant" to change the temperature of the indoor air to accommodate whatever temperature you set the unit to produce. The refrigerant is first compressed (creating heat), then decompressed (cooled). As the refrigerant is decompressed and causes a cooling action, a fan is used to blow air across the now cold refrigerant lines to move cool air into your living space. Most HVAC systems today can accommodate both air conditioning and heating from a single central unit. This is possible due to an internal valve that reverses the process of cooling the air and heats it instead. In this way, you can install one system that keeps your home warm in the winter and cool in the summer. One of the first indications that you may have a brewing maintenance issue or even a mismatch between the HVAC unit and the space to be heated/cooled is rising utility bills. Once you rule out a simple case of extreme temperatures as the cause, it is time to take a look at HVAC system maintenance. The increase in costs could be caused by something simple such as a clogged filter or dirty ducts. Or it could be an indication of a more major repair, such as a malfunctioning thermostat or damaged fan. If the HVAC system repair is more major than minor, it may prompt you to consider replacing your HVAC unit instead. This can be especially relevant if your system is more than a decade old, if you plan to renovate your existing space by adding to it, or you are also struggling with inconsistent temperatures or rising humidity from room to room. For a newer unit that needs a major repair, it’s advisable to check your warranty first and contact the manufacturer to see what may be worked out. For an older unit that needs a major repair, the cost savings you stand to realize by upgrading to a new energy efficient system often more than justifies the up-front investment. Current estimates show that most customers report savings in the neighborhood of 15 to 20 percent just by choosing an Energy Star-rated HVAC unit for their new system. Whether you decide to make repairs or replace your existing unit with a new HVAC system, the importance of scheduling routine maintenance cannot be overstated, for both safety and cost reasons. Maintenance can catch brewing issues while they are still small and cheap to fix. Maintenance can also remove potential safety hazards like loose parts, debris, and unwelcome visitors before they result in serious damage to property and premises, including the risk of electrical fire (rodents in particular are prone to chewing through electrical wiring in their quest to build a secure nest). Whether you learn to do the minor maintenance on your own on a schedule of your choosing or you prefer to contract with your local HVAC specialist to provide this service, what you will save will easily outpace anything you may spend, and by performing routine maintenance on a regular basis, you also stand to extend the life of your HVAC unit in the process. When the time comes, the most critical elements of choosing a new HVAC unit are energy efficiency and capacity. Capacity refers to matching the output of the unit to the size of the space to be heated and cooled. Your HVAC specialist can help you select a unit that meets your requirements for both energy efficiency and capacity and has a warranty plan you can trust. For questions about your HVAC unit, contact us anytime at 905-549-4616 or online at www.shiptons.ca.